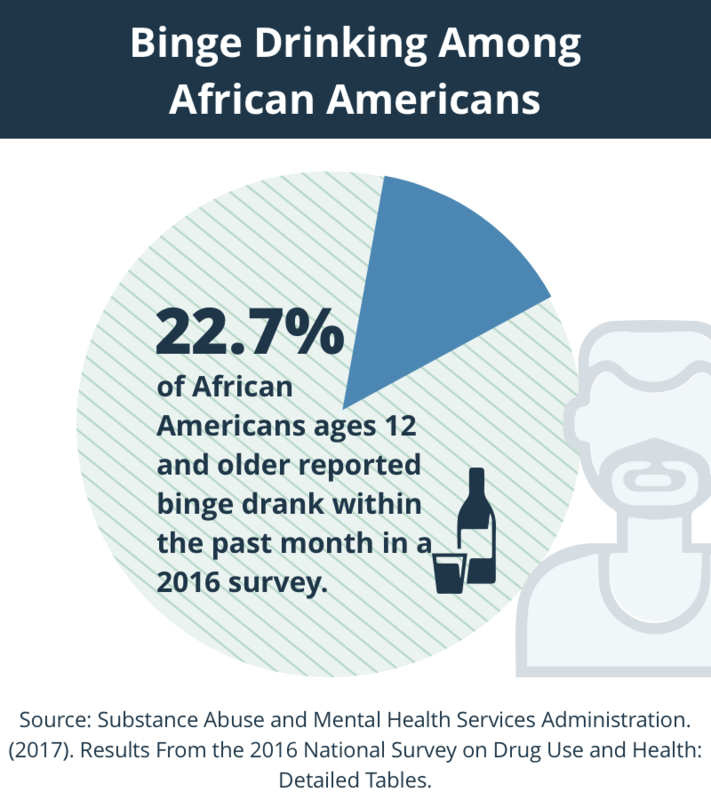 What Are Some Causes of Substance Abuse Among African Americans? Which Types of Drugs Are Used in These Communities? How Is This Population Affected by Drug Abuse? What Barriers Do African Americans Face in Getting Treatment? Does This Group Have Any Special Needs in Treatment? Where Can African Americans Get Help for Addiction? What Are Some Options for Paying for Treatment? What Is Aftercare? Why Is It Important? Trauma, poverty, mental illness, and homelessness can all lead to addiction in African Americans. Unfortunately, they may be less likely to seek out recovery programs and may experience more barriers to treatment than other groups. The key factors to getting help are recognizing the signs of drug abuse, becoming aware of payment options, and finding providers who understand the issues unique to this population. Mental illness. African Americans are more likely than white Americans to have an undetected mental illness and to not receive adequate treatment. 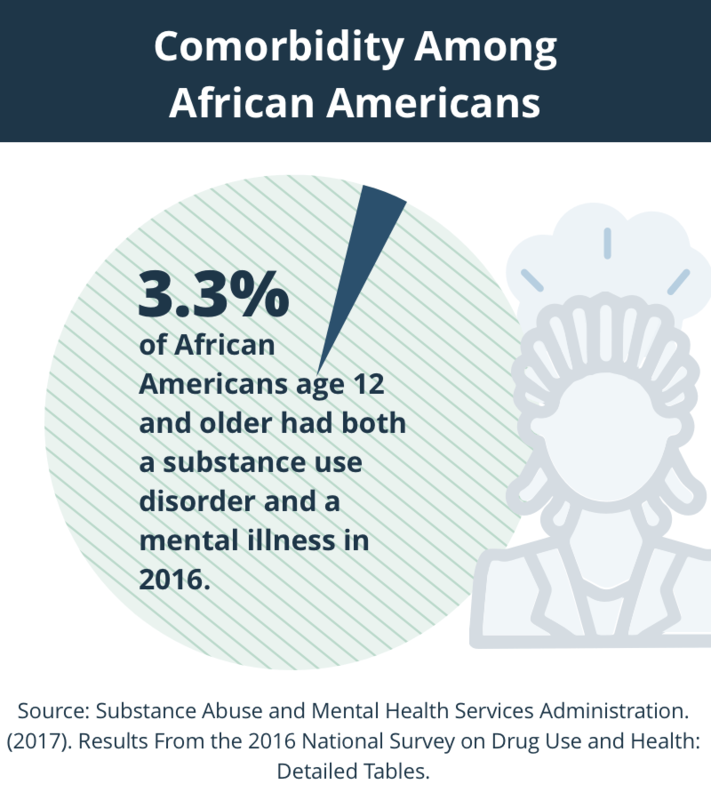 African Americans that suffer from an untreated mental illness, such as depression, anxiety, or bipolar disorder, may be at risk of using drugs and alcohol as a way to cope with their illness. Trauma. African Americans have high rates of exposure to trauma, including experiencing and/or witnessing physical, emotional, or sexual abuse, violence, and crimes. Traumatic experiences can lead to posttraumatic stress disorder (PTSD), a mental health condition that involves severe anxiety. Untreated PTSD is associated with an increased incidence of substance abuse behavior. Access to drugs. 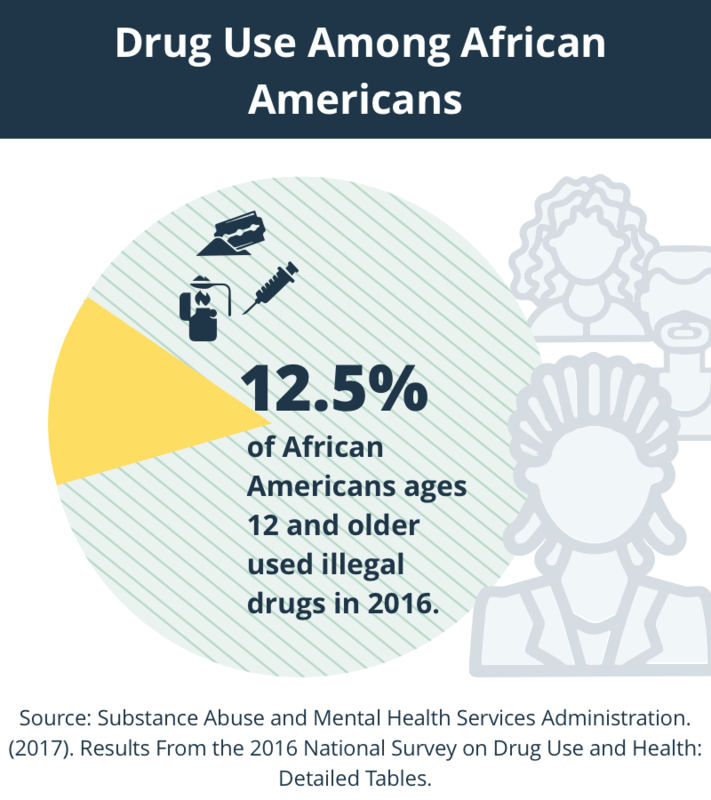 Living in communities where drugs are widely available can put African American youth at risk of experimenting with drugs and alcohol and eventually developing addictions. Communities with few economic and academic opportunities can also contribute to early adolescent drug use. Crime and violence. Living in areas marked by crime and violence can cause higher levels of stress and posttraumatic reactions, which can increase the risk for substance abuse. Poverty and homelessness. Communities that experience poverty tend to have higher rates of drug and alcohol use, especially among men. People living in poverty and those who are homeless are often unable to afford treatment even if they would like to get help. Poverty is also associated with stress and mental illnesses such as depression and schizophrenia. Racism and discrimination. African Americans are vulnerable to racism and discrimination, which can lead to stress, poor health, and diminished well-being. Some African American adults and children may turn to drugs and alcohol to cope with the stress. African American youth are more likely than white youth to have seen drugs sold in the community. Marijuana. 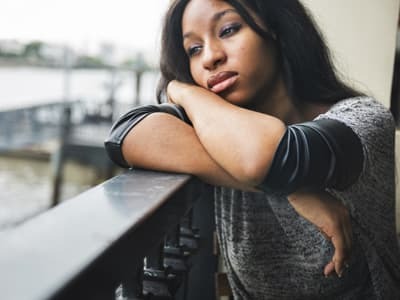 African American youth are more likely than white youth to have seen drugs sold in the community and to perceive marijuana as easy to obtain.2 One study found that almost 75% of African Americans with a diagnosed depressive episode also abuse marijuana.1 This suggests that in some cases, marijuana may be a form of self-medication. Taking larger amounts of a drug over a period of time. Unsuccessfully trying to cut down. Spending a long time acquiring, using, or recovering from the effects of a drug. Feeling urges to use a drug. Difficulty carrying out responsibilities at home, work, or school because of drug use. Continuing to use a drug despite relationship problems. Giving up important activities because of drug use. Using a drug in dangerous situations. Continuing to use a drug despite physical or psychological problems because of drug use. Building tolerance, or a need for more of a drug to feel the same effects, or experiencing less of an effect with the same amount. Having withdrawal symptoms when trying to quit or cut down. Physical health problems, including kidney damage, liver damage, heart problems, and cancer. HIV, hepatitis, and other infectious diseases. Pre- and postnatal effects, including low birth weight and cognitive delays in children. Mental health problems, such as depression and anxiety. African Americans are incarcerated due to drug-related offenses at higher rates than other ethnic groups. Failure to recognize the signs of addiction and mental illness. Many Americans simply do not know the symptoms of addiction and mental illness. They may acknowledge the problem, but they may deny that the problem is serious or choose to ignore it. Stigma. Like many Americans, African Americans may attach a stigma to addiction and mental illness. These types of problems may be associated with weakness, poor judgment, or a lack of control over behavior. This stigma can lead to guilt and shame, which may deter people from getting help. Distrust. African Americans have a history of racial inequality and discrimination that has led to a distrust of public and government policies. This distrust may also extend to healthcare agencies, leading people to avoid seeking services. 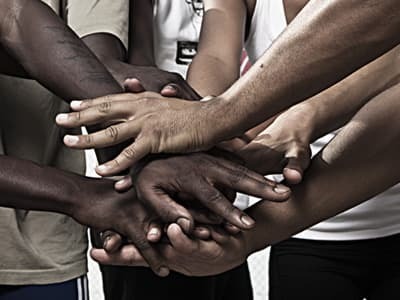 African Americans may feel more comfortable seeking help from family members, spiritual or religious leaders, or members of the same cultural group. Cost. Being unable to afford treatment and not having access to health insurance can be significant barriers to getting help. Fortunately, the costs of treatment can be managed in different ways. See “What Are Some Options for Paying for Treatment?” below. Lack of childcare. African Americans may be unable to seek treatment because of family responsibilities and the high costs of childcare. This is especially true for single-parent households. A portion of treatment programs do offer childcare, making it easier to balance getting help with managing family responsibilities. Lack of knowledge about services. Some members of this group may be unaware of the types of treatment programs available in their communities. In fact, a survey in the 1990s found that African Americans were more likely to go to their general practitioners than mental health specialists for this type of treatment. 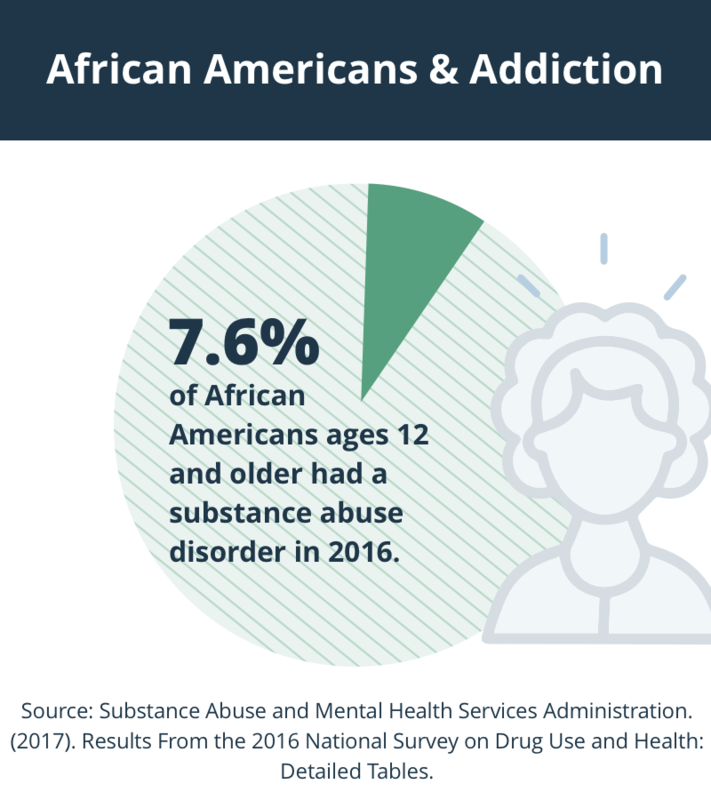 Understanding the different treatment and recovery options available can help African Americans struggling with addiction find the right program. Religion and spirituality. Religion and spirituality are important parts of the lives of many African Americans.1 Incorporating religion into treatment may help this group get more out of their program. Family support. Family relationships can be a source of support for African Americans. Relationships tend to suffer during addiction. 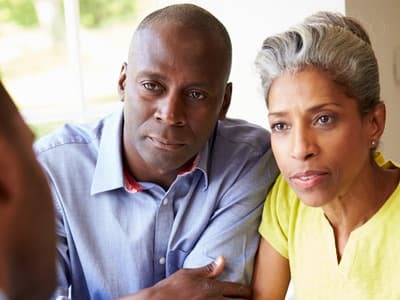 However, African Americans are more likely to stay connected with family members even while using drugs and alcohol.1 Family may be incorporated into treatment by having them participate in therapy sessions and recovery meetings. Employment assistance. Unemployment can be a significant stressor that may increase the risk for relapse. Providing job training and assistance can be helpful for people that are unemployed. Medical treatment. Medical assessment and treatment for HIV, AIDS, sexually transmitted diseases, and other health problems can be beneficial, since African Americans are at greater risk of experiencing these health consequences during addiction. Housing assistance. Homelessness is a significant stressor that ought to be addressed in treatment. People that are homeless may need assistance finding and applying for government-funded housing, for example. Culturally competent treatment. Culturally competent treatment takes into account African Americans’ unique backgrounds and struggles. Culturally competent addiction treatment also involves an awareness and understanding of how cultural factors impact a person’s drug and alcohol use and recovery.1 Cognitive behavioral therapy (CBT) is one type of treatment that has shown to help African Americans.1 This approach focuses on developing a collaborative relationship between therapist and client, understanding the connection between a person’s thoughts, feelings, and behaviors, and developing healthy coping strategies and relapse prevention skills. Detoxification. This level of care is necessary for anyone experiencing withdrawal symptoms. Withdrawal may occur when a person stops using drugs or alcohol after a period of heavy use. These symptoms can be uncomfortable and in some cases even dangerous. During detox, medical professionals closely monitor and treat withdrawal symptoms until the substances are completely out of a person’s system. Inpatient treatment. Inpatient programs provide both temporary housing and intensive treatment. Staff monitor participants 24 hours a day. During the course of treatment, participants take part in therapy sessions, support groups, and other recovery-related activities. Outpatient treatment. During outpatient treatment, participants visit a treatment facility each week to participate in therapy sessions. Housing is not provided, and participants often either live at home or stay in a sober living facility. Nonprofit treatment programs. Nonprofit programs offer free or low-cost addiction treatment to people that cannot afford private programs. The Salvation Army and Catholic Charities are two nonprofit programs with locations throughout the United States. Government-funded programs. Some treatment programs are funded by state or local governments and offer free or lower-cost services to members of the community. Twelve-step treatment programs. These treatment programs are based on the philosophy of Alcoholics Anonymous. They assume that recovery can be achieved by accepting one’s addiction, surrendering to a higher power, and developing a support network of other sober people. African Americans may feel more comfortable seeking treatment from culturally competent providers. These providers have a knowledge and understanding of African American culture and history and how to treat people from this ethnic group. Researching different programs and reading reviews can provide some information on whether a program provides culturally competent treatment. Do you have experience treating African Americans? Is your staff trained in cultural competence? How can your program incorporate my beliefs and cultural values into my treatment? The cost of addiction treatment should not prevent someone from seeking help. There are several ways to find affordable treatment. Health insurance can help cover some or all of the costs of a treatment stay. The amount that health insurance covers varies from plan to plan. For people that do not have private health insurance, public health insurance is available through the Affordable Care Act (ACA). The ACA was passed in 2010 and expanded affordable health coverage throughout the United States. The HealthCare.Gov website can walk you through the process of applying for health insurance during an open enrollment period. If you are in need of health insurance outside of an open enrollment period, the website can also help you determine whether you qualify for a special enrollment period. Sliding scales offer a reduced fee based on annual income and household size. Payment plans allow you to slowly pay off the costs of treatment over an extended period of time. Scholarships are grants that may cover all or a portion of the costs of treatment. You can ask about whether a program offers sliding scales, payment programs, and scholarships by contacting the treatment facility directly. Additionally, the Substance Abuse and Mental Health Services Administration’s (SAMHSA) Behavioral Health Treatment Services Locator is a searchable database of local substance abuse and mental health treatment centers. The online locator includes free and low-cost rehabs for people of all income levels. SAMHSA’s National Helpline (1-800-662-HELP) also provides free and confidential support 24 hours a day. Housing. Living in a sober environment is important in early recovery. Sober living facilities or halfway houses are drug-free homes that have specific rules in place to help residents remain sober. Residents are expected to submit to random drug-testing and to abide by a curfew. Continued treatment or therapy. Continuing therapy after a treatment program can help maintain motivation for recovery. Seeing an individual therapist or participating in a therapy group may improve the chances of success. Recovery support groups. Developing a sober support system is another important component of long-term recovery. Twelve-step groups such as Alcoholics Anonymous and Narcotics Anonymous help members accept their addictions, surrender to a higher power, and develop a sober support network. SMART Recovery is another recovery support group that helps members maintain motivation for sobriety, cope with urges, manage their thoughts, feelings, and behaviors, and achieve lifestyle balance. The National Alliance on Mental Illness provides information and resources for African Americans on a wide range of mental health issues. The organization also offers tips for how to find a culturally competent treatment provider. Drugs, Alcohol, and HIV/AIDS: A Consumer Guide for African Americans is a pamphlet published by the Substance Abuse and Mental Health Services Administration (SAMHSA) that explains the risks of contracting HIV and AIDS among African Americans who abuse drugs and alcohol. The pamphlet also provides information on what to do if you have been diagnosed with HIV or AIDS. Keeping Your Teens Drug-Free: A Guide for African American Parents and Caregivers offers information on the dangers of teen drug use and tips for parents on preventing and helping teens who have already begun experimenting with drugs and alcohol. Alcoholics Anonymous (AA) provides support for anyone who is addicted to alcohol and has a desire to quit drinking. Meetings are available in over 170 countries in several different languages. For more information on how AA can help African Americans struggling with alcoholism, see A.A. for the Black and African American Alcoholic. Substance Abuse and Mental Health Services Administration. (2014). Improving cultural competence. Treatment Improvement Protocol (TIP) Series No. 59. HHS Publication No. (SMA) 14-4849. Rockville, MD: Substance Abuse and Mental Health Services Administration. Wallace, J. M., & Muroff, J. R. (2002). Preventing substance abuse among African American children and youth: Race differences in risk factor exposure and vulnerability. The Journal of Primary Prevention 22(3), 235-261. Gibbons, F. X., Gerrard, M., Cleveland, M. J., Wills, T. A., & Brody, G. (2004). Perceived discrimination and substance use in African American parents and their children: A panel study. Journal of Personality and Social Psychology 86(4), 517. Chartier, K., & Caetano, R. (2010). Ethnicity and health disparities in alcohol research. Alcohol Research & Health 33(1-2), 152-160. Substance Abuse and Mental Health Services Administration. (2013). The TEDS Report: Non-hispanic black substance abuse treatment admissions for cocaine decreased from 2000 to 2010. National Institute on Drug Abuse. (2017). Health consequences of drug misuse. Volkow, N.D. (2005). NIDA addresses disparities in the impact of drug abuse and addiction. NIDA Notes, 19(6).